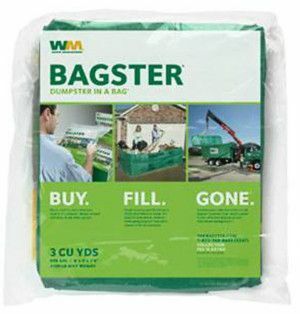 The Bagster from Waste Management is your solution for heavy, awkward waste caused by renovations and home cleanouts. This unique temporary dumpster provides quick and efficient removal of large debris and heavy debris that is too difficult to bag or too time consuming to take somewhere to be salvaged. Many of our customers who purchase a Bagster are in the middle of a do-it yourself home renovation, redoing landscaped areas outside, or cleaning out a storage area. The Bagster is convenient to use and easy to obtain. Simply pick up a Bagster from your local hardware store, and place it close to your curb when you are ready to start filling. There is no time limit with the Bagster – fill it at your own rate and keep filling it up until the project is done! Scheduling for a pick-up is just as convenient, you may do so on the website or over the phone with Waste Management. The collection fee for one Bagster is about $139, but for its quick and efficient removal of large debris, we consider it a big time saver and worthy of the “spend a little – save a lot” portion of our Blog. The Bagster measures 4ft x 8ft x 2’6″ deep, which amounts to a whopping 3 cubic yards are debris. There is no top, but the fill is not meant to extend over the lip on the Bagster. Also, very heavy waste (such as dirt, stone, brick, metals, or the like) can only amount to about 1/3 of the capacity of the Bagster.